First let me say it again. I love absinthe. The real stuff. 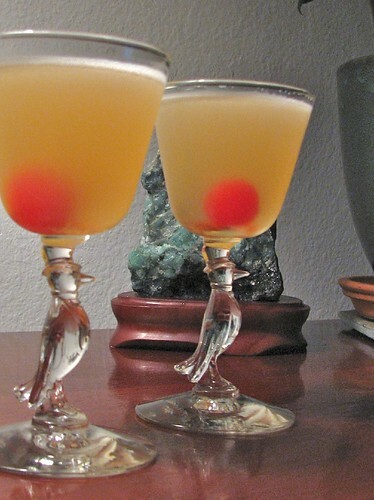 This cocktail comes from a whole family that dates back to the late 19th century. Credit for this particular version, according to Ted “Dr. Cocktail” Haigh’s Vintage Spirits and Forgotten Cocktails, is given to the #2 Savoy barman, Harry Craddock. This is one of those great classic era drinks that highlights the alchemy of a truly great cocktail. 1 oz. Fresh Lemon Juice. Shake with ice and strain into a chilled cocktail glass. Drop a stemless cherry in the bottom. Both Brenda and I really liked this cocktail. I with the good Docotor that it is now one of our favorites.